Status: Active aid to navigation owned by the U.S. Coast Guard and licensed to the American Lighthouse Foundation. 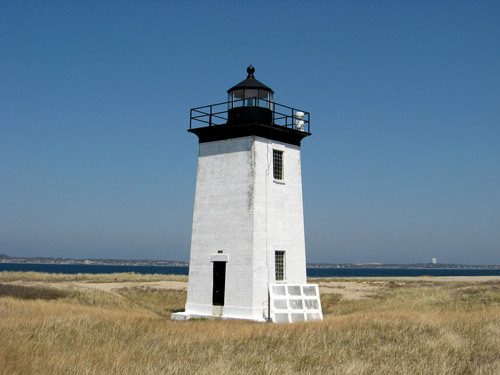 The Cape Cod Chapter – a chapter of the American Lighthouse Foundation is dedicated to restoring the historic lighthouse. The first Long Point Lighthouse was constructed in 1826 and consisted of a lantern atop a keeper’s dwelling. The beacon exhibited a fixed white light from a focal plane of 35 feet that was visible 13 nautical miles. The lighthouse was outfitted with a sixth order Fresnel lens in 1856. By 1873 an inspectors report expressed concern that a “heavy storm” could carry away the lighthouse given the adverse affects of erosion on the very tip of Cape Cod where the structure was located. Two years later in 1875, the U.S. Lighthouse Service completed the present day lighthouse that occupies Long Point Light Station. The new brick lighthouse was built to a height of 38-feet, with a 1½ story keeper’s house built nearby. In addition, the light station was outfitted with a 1,200-pound fog bell and its Fresnel lens upgraded to a fifth order. It wasn’t until 1904 that the station received an oil house to properly store its flammable materials. Today, the keeper’s house and fog signal building no longer exist. The lighthouse tower receives annual maintenance in order to preserve and protect the historic structure. The lighthouse is not open to the public, but can be viewed from a distance in Provincetown. For the adventurous, the grounds are open to the public as part of the Cape Cod National Seashore.